Left to their own devices, grape or kiwi vines would, every year, grow larger and larger, eventually, if once coming upon something to climb, sending their fruits further and further out of reach. Or, if not out of reach, then increasingly tangled in a mass of stems. In the dank interior of that mass of stems, many a grape would have rotted rather than ripened. Most importantly, though, grape or kiwi berries on untended vines don’t taste that good. Self-shading cuts down flavor-producing photosynthesis. And the plants’ energies must be spread among too many fruits; pruning limits yield but lets the plants pack more flavor into what fruit remains. 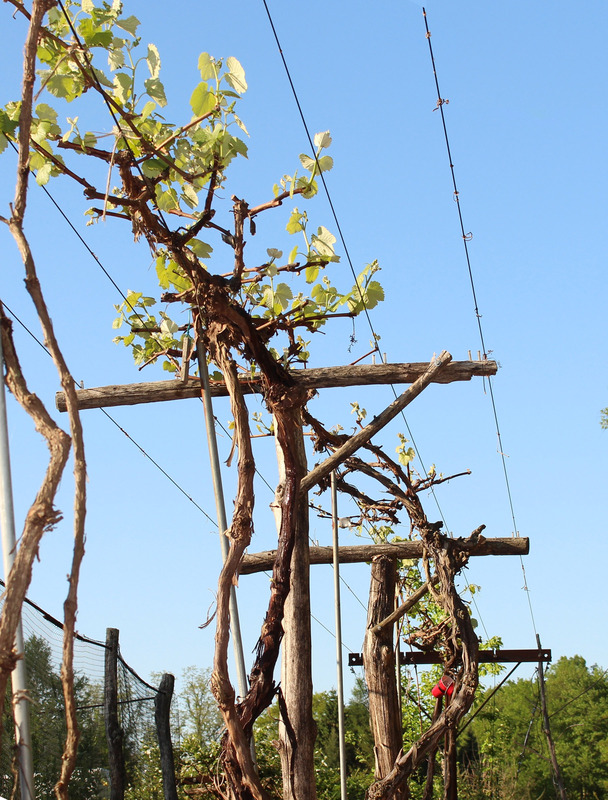 The first thing I did, when I began pruning a few weeks ago, was re-organize the vines. Both bear fruits on new shoots growing off one-year-old canes. I train these plants on T-shaped trellises, with 5 wires stretched from T to T. A trunk rises to the height of the wires, at which point it bifurcates into cordons — permanent arms — each traveling in opposite directed up and down the middle wire. The one-year-old fruiting canes are splayed out perpendicularly to the cordons. 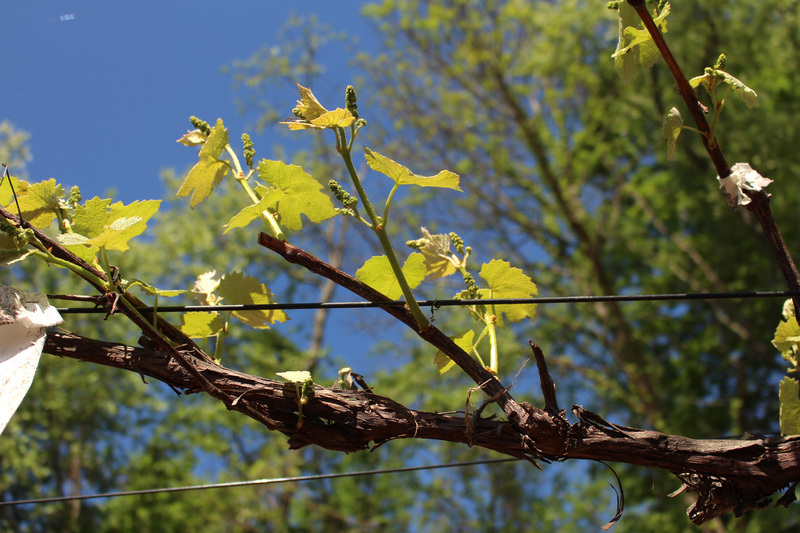 Both vines grow prodigiously every year, the fruiting canes too long and too abundant. So I shortened all the canes to 3 to 4 feet long, which was just beyond the outer wires, and cut off those super-vigorous ones having stratospheric aspirations. Still too many canes: So I reduced their numbers. A couple of weeks ago, I went over the vines again, aiming (ideally) for one cane on either side of the cordon every 6 inches or so. The average date for the last killing frost here is around the third week in May. Evidently not so, this year, but I wanted to wait to do the final grape and kiwi pruning until after that date. The tips of the canes would be the first to grow and, hence, frosted, which is not a problem if the canes would anyway be shortened again. Now that frost is probably just a memory, I thinned out the canes one last time — to almost a foot apart — and further shortened those that remained. The grape canes got shortened to two buds each and the kiwi canes to about 18 inches long. The next order of business, for just the grapes, will be bagging the bunches. 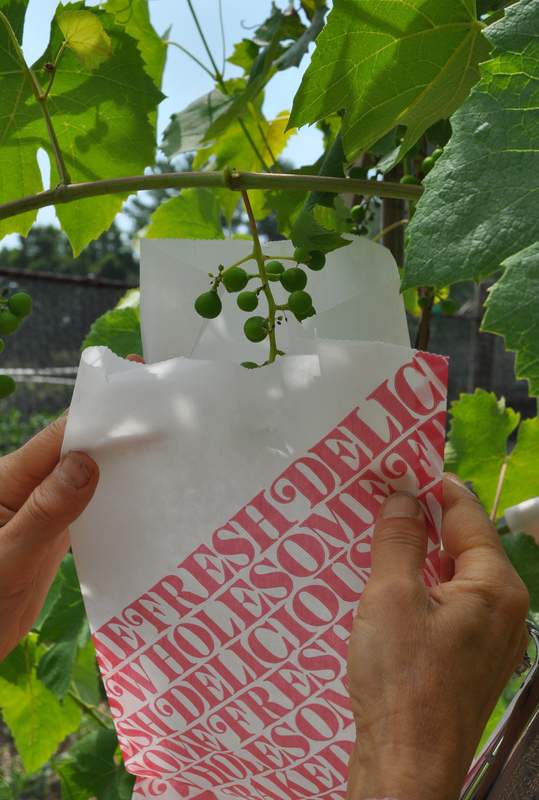 I’ll wait until the berries have begun to swell and then partially slit the folds of delicatessen bags so that they can be slid over a bunch with the stem holding the bunch sliding into the slits. Each bunch has a leaf or a tendril opposite the bunch which needs to be clipped off so the top of the bag can be tightly folded over the stem, then stapled shut on either side, just below the slit. To see rather than, or in addition to, read about bagging grapes, see my video. Why the bags? To keep diseases, birds, bees, and other insects at bay. With this protection, ripe bunches can be left hanging longer than usual to develop very rich, sweet flavor. Worst case scenario is that a bag is opened and there’s nothing inside. This sometimes happens. Best case scenario is peeling open a bag to reveal a perfect bunch of grapes with perfectly ambrosial flavor. I’m glad I planted the hardy kiwi vines many years ago because it may be illegal to do so in the future. Yes, illegal! No, not because you can smoke the plant, but because has raised eyebrows in certain invasive plant circles. Nonetheless, it’s a very attractive vine with very tasty fruits. And mine have remained well-behaved in the quarter of a century that they’ve been in the ground. In case fellow New Yorkers were not aware of this, as of March 10, 2015 it will no longer be legal to buy, sell or transport 126 species identified by the New York State Department of Environmental Conservation as invasive. Sixty-nine of these species are plants; hardy kiwi vines are not one of them — yet. I don’t doubt that there are plants that threaten to take over the world. Well, not the world, but certain ecosystems. Which is why garlic mustard, Japanese knotweed, and autumn olive are on that most unwanted list, despite their qualities. Autumn olive, for example, enriches the soil with nitrogen garnered from the air by symbiotic microorganism at its roots. Its flowers sweetly perfume the air in spring. And the small berries that ripen in early fall, if harvested as soon as they have lost their astringency, are rich in flavor and super-rich in healthful phytochemicals known as lycopenes. Hardy kiwifruit has not been banned anywhere, but in 2012 Massachusetts Audubon Society published an Invasive Plant Pest Alert strongly urging people not to grow or propagate this plant. Their statement was based on apparently rampant growth that was documented at two sites in Massachusetts and one in New York. The findings don’t jive with the good behavior of numerous vines that have graced gardens, as ornamentals, in Eastern U.S. since the late 1800s. Perhaps most of those planting included only female or only male plants, in which case no viable seeds would be produced, although the vines could also have spread by climbing trees or rooting where they touch ground under the right conditions. Male and female kiwi vines do socialize when grown for fruit in commercial and research plantings. But again, plants hardly, if ever, have multiplied on their own at these locations, which concurs with my observations here on the farmden. As a general rule, only 10 percent of any introduced species are likely to become established on foreign ground, and only 10 percent of those plants are likely to become invasive. Let’s be very careful in our condemnations and not blow the threat of invasive species out of proportion. This Saturday, May 30, 2015, Permaculturesque Plant Sale at my New Paltz, NY farmden, from 10 am until 2 pm. Ornamental plants, edible plants, and ornamental AND edible plants such as 2 crop figs, hardy oranges (Poncirus), rosemary, dessert gooseberries, delicious and nutritious black currants, and much more. This entry was posted in Fruit, Pruning and tagged Actinidia, grape, hardy kiwi, invasive, training, Vitis. Bookmark the permalink. Trackbacks are closed, but you can post a comment. « EEK, A DINOSAUR IN MY COMPOST PILE! I bought a hardy kiwi after seeing those cute little fruits on one your sites, Lee. I have basically ignored it because it is on the side of my house where I don’t garden anymore because my neighbor does and keeps encroaching so I just become angry. It hasn’t done much – planted in the Fall and followed by two extreme winters. I feel bad now. I will give it some more attention this weekend as I did note early Spring that it is making effort. I set up some wire grid for it to reach the porch. Perhaps a little compost and mulch. My dream is for it to grow up the porch so I can pick the fruits (and prune) from my porch – it will also make a lovely, edible screen. It is a beautiful vine and deserves more. I hardly think it will be invasive (unless my neighbor decides to propagate it as she just seems to help herself to my garden). Yes, hardy kiwi is well worth “cultivating” both for its fruit an its beauty. But it does need regular pruning. With age, it becomes less susceptible to cold weather. Are the hardy kiwis spreading by seed or are existing vines just reaching out and finding trees. I live not far from the Berkshires, in a similar ecozone, and, after 30 years of growing hardy kiwis, have not seen one “escape” or seedling. I’d like to know where these “100 year old trees” are being pulled down. Have to admit I’m a bit skeptical about hardy kiwi taking over “acres of what was forest to create a monoculture.” Grapes and Asian bittersweet, while not quite as vigorous as hardy kiwifruit, spread and climb trees but neither has created a monoculture, or something even close. Please provide more detailed information about origin of the kiwi plants and sites they are devastating. Hi Lee – I set out to prune my kiwis today after sitting down with your pruning book, yet was still overwhelmed by my densely overgrown vines, and subsequently bumped into your blog via a quick, desperate internet search for more tips. Thank you for posting so much information about growing kiwis! The drastic renovation would be to cut the whole thing down and then select a new trunk and cordons from the very vigorous regrowth. Alternatively, cut away everything at ground level except for one, which will be the trunk. Cut back everything on the trunk except what’s needed for the framework and fruiting stems. Once you get the pant in order, annual pruning will be much easier — as long as you keep up with it. The plants are very amenable to all sorts of lopping back.